Note: From the message starting to ending, there is an interpretation goes on. Based on this interpretation only the message is received. 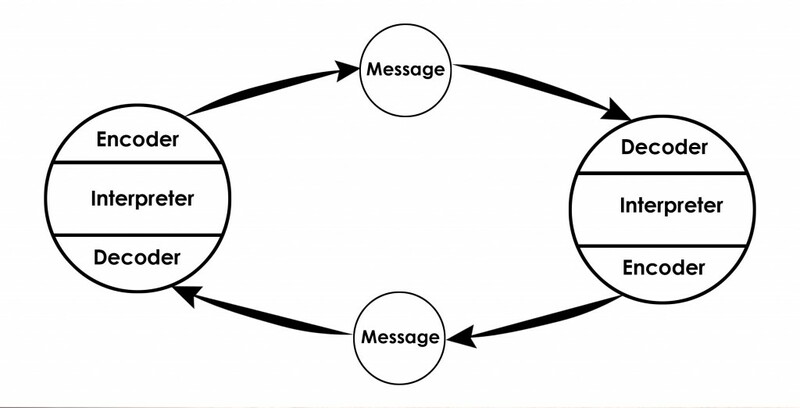 This model breaks the sender and receiver model it seems communication in a practical way. It is not a traditional model. It can happen within our self or two people; each person acts as both sender and receiver and hence use interpretation. It is simultaneously take place e.g. encoding, interpret and decoding. Semantic noise is a concept introduced here it occurs when sender and receiver apply different meaning to the same message. It happens mostly because of words and phrases for e.g. Technical Language, So certain words and phrases will cause you to deviate from the actual meaning of the communication. Note: When semantic noise takes place decoding and interpretation becomes difficult and people get deviated from the actual message. This model does not talk about semantic noise and it assume the moment of encoding and decoding. Yes yes… this should get me another distinction ! It is very helpful note for the students who are studying communication & media studies subject..So, thank you very much! Good and nice and wiggly and bebe. It appears to be shallow, but I appreciate. Can you expand the idea a little more?????……………. I was a little shorted about your ideas……………..